Casino Upgrades will be available to replace Speakeasy locations. Casino Improvements - At any point in the game, should a player have the money, a speakeasy may be redeveloped into an upscale casino. That player abandons their trucks and stills to operate the casino for the rest of the game. 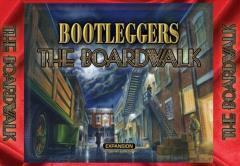 Minor enhancements to the original rules integrate casinos into the gameplay of Bootleggers.